Unsightly leg veins can be commonly seen on both men and women. These become prominent on the surface of the skin when they get enlarged and dilated, and hence, they are also known as surface veins. These can vary in size and colour, from the tiny red spider veins to thicker, blue varicose veins. Spider veins are used to refer to the smaller, thread-like blood vessels visible on the surface of the skin. They can be red, blue or purple. They can be commonly seen on thighs, feet, and ankles and even on the face at times. They are unsightly and could even be misconstrued for being bruises. While spider veins are mostly harmless, they can at times cause pain, aches and a burning sensation, especially if you have been standing for a long time. Varicose veins, on the other hand, are larger, blue coloured veins that occur on the surface of the skin, triggered by tired or heavy legs. These are often the result of some deeper vein issues, and are said to cause health issues like aching, cramping, swelling and throbbing. In severe cases, these veins can form unappealing bulges on the skin, and are even said to cause some ulcers or ruptures. They are usually found on the legs and thighs. While they can occur at any age, they aggravate with age are more common among older people. Both spider and varicose veins are caused due to structural abnormalities in the veins. Veins are designed for a one-way flow of blood back to the heart, and have valves that prevent backflow of blood. Sometimes, these valves can stop working, causing backflow of blood within veins, resulting in blood pooling and increased pressure within the vein. Spider veins and varicose veins then develop from the engorgement and dilation of these veins, resulting in an ugly appearance on the skin’s surface. There are no known ways to prevent spider veins, as they are often a result of genetics. There is a widely accepted belief that a healthy weight and regular exercise can help prevent the occurrence of leg veins, however, there is no direct link established on this. But these leg veins need not be a lifetime condition. Unlike days of yore, where surgery would be the only option, advancements in technology have made it possible to treat leg veins in clinics, without surgery. These non-surgical alternatives are safe with well known risks and can be performed in a day clinic, without the use of anaesthetic, and with minimal downtime. 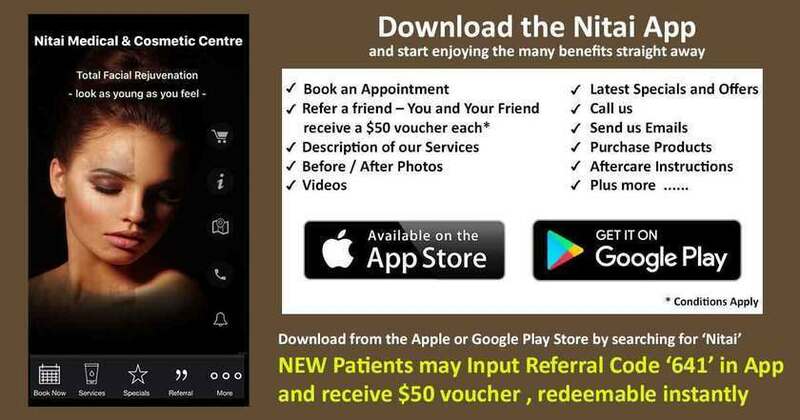 Nitai Medical and Cosmetic Centre offers treatments for spider vein removal in Melbourne, that can help reduce their prominence and can make them disappear. Sclerotherapy is one of the most popular options for spider vein removal in Melbourne. Depending on the modality used, there are different types of sclerotherapy. The most common one is Micro Sclerotherapy. This is used to treat surface veins on the legs. In this procedure, a fine gauge needle is used to inject surface veins with a sclerosant detergent solution. This solution causes the veins to scar and close, and seal them off. The blood will begin rerouting through healthier veins. The affected vein walls eventually collapse, and fade away. Each treatment can take from 20 to 60 minutes. No anaesthesia is required, and can be done easily in the clinic. Some possible side effects can be swelling, itching, burning and numbness. If you suffer from migraines, you could also experience more serious side effects that can include minor vision disturbances. Usually, no downtime is required and you can resume your daily routine almost immediately. This whole process is effective only if the injections are administered correctly, and can take up to a few weeks to show results. Surface Laser is another treatment option for small spider veins. It is very effective to treat spider veins on and around the face area – nose, eyes, chin and cheeks. In this, a narrow laser beam is directed at the affected veins in short, high power bursts. This causes the veins to ablate, and eventually dissipate. The blood in the veins absorbs the laser energy, and this causes the vein to shut down. The spider veins will fade away over a few weeks. Side effects can include redness, bruising, swelling and itching. spider veins, more than one treatment session could be required. This is a very comfortable procedure requiring almost no downtime. You can resume regular activities and work the next day. It is however advisable to stay away from activities like sauna or a hot tub bath, for at least 2 days after treatment, as these might cause the veins to dilate. Veingogh is a fast and easy way to treat spider veins, and is especially effective for spider veins on the face. In this process, microbursts of high frequency electrical energy are delivered to the affected vein, using a fine probe. The resistance of the veins converts this electrical energy to heat energy, which results in the blood getting coagulated, and the vein walls collapsing. The outer layers of the skin remain unaffected, and there is no visible damage to the surrounding tissue. Depending on the size of the area, treatment times can range from as little as one minute, till up to 30 minutes. The results are almost instantaneous and you will see significant improvement. But it might take several weeks for the treatment as the treated veins get reabsorbed. If you are interested in removing your spider veins, we invite you to reach out to us at Nitai Medical and Cosmetic Centre. You can book a no-obligation consultation, which will allow us to figure out the best treatment route for you, as well as give you an idea about the treatment costs. There are no known preventative treatments for spider veins. It is believed that a healthy weight and regular exercise can lessen your chances of vein issues. Genetics also play a part in whether you will have spider or varicose veins. The spider vein treatments offered by our Sclerotherapist at Nitai Medical & Cosmetic centre require little to no down time and have little side effects. If you are interested in removing your spider veins you can contact Nitai Medical & Cosmetic Centre.